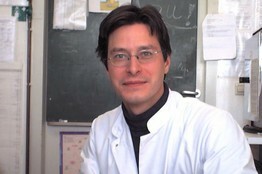 Dr. Gero Hütter isn't an AIDS specialist, but he 'functionally cured' a patient, who shows no sign of the disease. "I was very surprised," said the doctor, Gero Hütter. There were a total of 80 compatible blood donors living in Germany. Luckily, on the 61st sample he tested, Dr. Hütter's colleague Daniel Nowak found one with the mutation from both parents. To prepare for the transplant, Dr. Hütter first administered a standard regimen of powerful drugs and radiation to kill the patient's own bone marrow cells and many immune-system cells. This procedure, lethal to many cells that harbor HIV, may have helped the treatment succeed. The transplant specialists ordered the patient to stop taking his AIDS drugs when they transfused the donor cells, because they feared the powerful drugs might undermine the cells' ability to survive in their new host. They planned to resume the drugs once HIV re-emerged in the blood. But it never did. Nearly two years later, standard tests haven't detected virus in his blood, or in the brain and rectal tissues where it often hides. The case was presented to scientists earlier this year at the Conference on Retroviruses and Opportunistic Infections. In September, the nonprofit Foundation for AIDS Research, or amFAR, convened a small scientific meeting on the case. Most researchers there believed some HIV still lurks in the patient but that it can't ignite a raging infection, most likely because its target cells are invulnerable mutants. The scientists agreed that the patient is "functionally cured." Caveats are legion. If enough time passes, the extraordinarily protean HIV might evolve to overcome the mutant cells' invulnerability. Blocking CCR5 might have side effects: A study suggests that people with the mutation are more likely to die from West Nile virus. Most worrisome: The transplant treatment itself, given only to late-stage cancer patients, kills up to 30% of patients. While scientists are drawing up research protocols to try this approach on other leukemia and lymphoma patients, they know it will never be widely used to treat AIDS because of the mortality risk. There is a potentially safer alternative: Re-engineering a patient's own cells through gene therapy. Due to some disastrous failures, gene therapy now "has a bad name," says Dr. Baltimore. In 1999, an 18-year-old patient died in a gene therapy trial. Even one of gene therapy's greatest successes -- curing children of the inherited "bubble boy" disease -- came at the high price of causing some patients to develop leukemia. Gene therapy also faces daunting technical challenges. For example, the therapeutic genes are carried to cells by re-engineered viruses, and they must be made perfectly safe. Also, most gene therapy currently works by removing cells, genetically modifying them out of the body, then transfusing them back in -- a complicated procedure that would prove too expensive for the developing world. Dr. Baltimore and others are working on therapeutic viruses they could inject into a patient as easily as a flu vaccine. But, he says, "we're a long way from that." Expecting that gene therapy will eventually play a major role in medicine, several research groups are testing different approaches for AIDS. At City of Hope cancer center in Duarte, Calif., John Rossi and colleagues actually use HIV itself, genetically engineered to be harmless, to deliver to patients' white blood cells three genes: one that inactivates CCR5 and two others that disable HIV. He has already completed the procedure on four patients and may perform it on another. One big hurdle: doctors can't yet genetically modify all target cells. In theory, HIV would kill off the susceptible ones and, a victim of its own grim success, be left only with the genetically engineered cells that it can't infect. But so far that's just theory. All Dr. Rossi's patients remain on standard AIDS drugs, so it isn't yet known what would happen if they stopped taking them. In 1989, Dr. Rossi had a case eerily similar to the one in Berlin. A 41-year-old patient with AIDS and lymphoma underwent radiation and drug therapy to ablate his bone marrow and received new cells from a donor. It is not known if those cells had the protective CCR5 mutation, because its relation to HIV hadn't been discovered yet. But after the transplant, HIV disappeared from the patient's blood. The patient died of his cancer 47 days after the procedure. Autopsy tests from eight organs and the tumor revealed no HIV. The Foundation for AIDS Research, which uses the acronym amFAR, is the name of the nonprofit group cited in this article. The name of the group was incorrectly given as the American Foundation for AIDS Research. Lawrence Summers pulled out of the contest to succeed Ben Bernanke as Fed chairman after weeks of public excoriation, forcing President Obama to move further down the list of contenders to head the central bank. Lawrence Summers's withdrawal from the running to become the next Fed chairman increases the likelihood of continuity in central-bank policy for the next few years. Lawrence Summers's decision to pull out of the contest to lead the Fed sparked rallies in U.S. Treasury debt, stocks and currencies that have been most under strain since the Fed signaled a shift in monetary policy. Through mixed messages, miscalculations and an 11th-hour break, the U.S. stumbled into an international crisis and then stumbled out of it. Should You Bring Mom and Dad to Work? Why Do We Eat Junk Food When We're Anxious? What is the difference between a targeted military strike and war? Q: What is the best way to cut Medicare and Medicaid costs and provide affordable healthcare to most Americans?